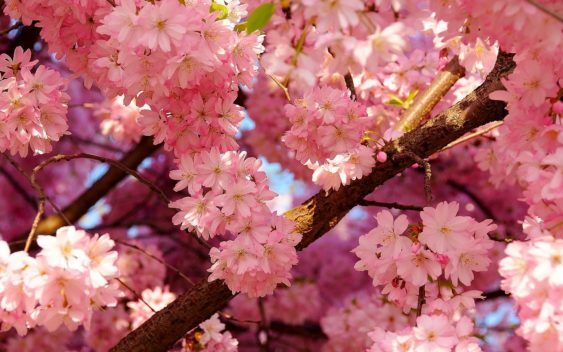 The annual Cherry Blossom Festival is a celebration of Japanese culture, with traditional exhibitions, entertainment and food. This fun family festival honors Cupertino’s sister city relationship with Toyokawa, Japan by sharing Japanese arts, culture & food with the entire community. Indoor cultural exhibits and demonstrations take place throughout the day in the Quinlan Community Center, featuring music and dance performances and cultural displays, demonstrations, workshops, and hands-on activities presented by professionals, non-profits, and special interest groups. Outdoor entertainment is held at the Amphitheater and includes Taiko drum groups, Japanese dancers, various martial arts, and musical performances throughout the day. VIP festival guests, local government, school board members, and students selected for the annual cultural exchange program will be introduced at noon on Saturday. Throughout the lawn areas will be arts and crafts exhibits and special interest groups such as Japanese dog and koi fish clubs. Children’s activities feature hands-on arts & crafts and a petting zoo. Local high school service groups will lead games/crafts. 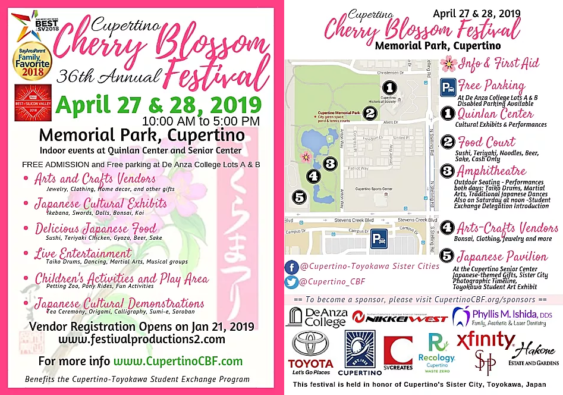 Japanese cultural arts and crafts vendors, a gallery of Toyokawa student artwork, and a pictorial timeline of Cupertino’s sister city relationship with Toyokawa will be grouped at the “Japanese Artisan Pavilion” located at the Cupertino Senior Center and patio. Food and drink include sushi, spam musubi, gyoza, asian chicken salad, yakisoba, mochi, teriyaki chicken skewers, hot rice, shave ice, fruit bowls, kettle corn, cotton candy, coffee, smoothies, beer, sake, plum wine, sodas and lemonade. There is a FREE parking is at De Anza College (Lots A&B).